Jarmila Rybánska (1962) took a great liking for textile techniques as a child. She learnt more about them as a student at the Secondary School of Applied Arts in Košice. She received a job of an in-house visual artist after graduation. She became a bobbin lace maker for the ÚĽUV in 1996. In 2001, Rybánska became a textile techniques lecturer at the ÚĽUV School of Crafts in Bratislava. She has held courses for children and adults until now. Rybánska was awarded the title of folk art production master for bobbin lace making in 2001. She makes textile products during her free time and when attending bobbin lace making clubs. Jarmila Rybánska has mastered mainly traditional textile techniques typical for the territory of Slovakia such as loom weaving, needle weaving, wood board weaving, card weaving, fishing net weaving and form knitting. She learns new things in creative courses. She has attended the ÚĽUV courses of jewellery making, paper string knitting and felting, Easter eggs decorating, cornhusk and wicker products making, straw decorations making, tin casting and tinker techniques. From all textile techniques she has mastered she mostly chooses bobbin lace making. She has designed and made several collections of table cloths and dining sets using asymmetric lace. Rybánska has also made bobbin lace clothing fabrics, quilts, jewellery, pictures and objects. She has presented her creative work at various lace making events and club-organised and all-Slovak bobbin lace exhibitions. 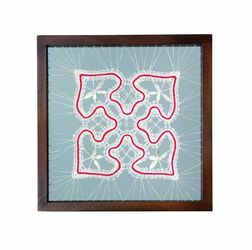 J. Rybánska gets inspiration for her creative work from traditional bobbin lace regions of Slovakia. She started to design lace making forms for beginners and advanced lace makers in 2001. She has adjusted traditional lace patterns at bonnets and home textiles to fit contemporary lifestyle needs. Using computer-assisted drawing, she has prepared numerous forms of traditional lace from the regions of Gemer and Liptov. In the ÚĽUV School of Crafts in Bratislava, Rybánska is a lecturer in the courses of felting, fishing-net weaving, batik making, loom weaving, frame weaving, joining stitches, lace weaving and cord making, tassel making, form knitting etc. She wrote Šnúry a pletence/Cords and ropes (2011) and Tkanice/Laces (2012) for the School of traditional production and crafts edition.